Continue reading for a look at some of the Spirit’s most notable statistics heading into the showdown at the SoccerPlex. Order tickets for the next two Spirit home games for one price: For as low as $25 fans can attend both our August 26 game against the Chicago Red Stars, and our August 30 game against the North Carolina Courage. *Offer ends on Wednesday, August 23 at 11:59 p.m. ET. On Saturday, the Spirit will seek to make it five games in a row without a loss when playing at the Maryland SoccerPlex’s Maureen Hendricks Field. The current four-game streak dates back to June 3, when the Spirit earned a 2-0 clean sheet win over the Houston Dash. It continued with a 1-0 shutout of Portland Thorns FC on June 24, followed by 2-2 draws against the Orlando Pride on July 8 and the Boston Breakers on August 12. Well known for her playmaking abilities as a prototype No. 10, Banini has shown her precision over the past three games, leading the team in passing accuracy on the attacking half of the field. 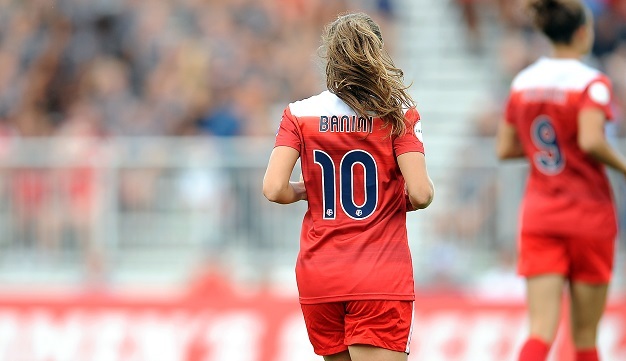 Last weekend against the North Carolina Courage, Banini led all players on both teams with her 36 total passes in the opposing half, finishing one ahead of teammates Meggie Dougherty Howard and Mallory Pugh. Finding her stride since returning from injury earlier this season, Dydasco has started all four of Washington’s games so far this month, leading the defense with 15 tackles. Seven of those tackles came last Saturday in North Carolina, where she also finished second on the team with three interceptions, one behind Kassey Kallman. Pugh and Williams enter the weekend tied for the team lead in shots with 32 each. The forwards are also tied for third on the team in goals with three each, trailing only Havana Solaun (5) and Francisca Ordega (4). In her third season with the Spirit, Johnson has played a leading role on the defensive side as well as in the possession battle from her right back position, leading the team by a wide margin in total touches on the ball. No other Spirit player has eclipsed 900 touches through the team’s first 18 regular season games.